The front doors in most homes in Maine are strictly "decorative". Some don't even have steps leading up to them. We used to use our front door because it lead to "our" part of the house and the door on the side of the house where the driveway is located was the door to my parents apartment. Well, walking up and down those stairs about 70 times a day has finally taken it's toll and we moved downstairs and took over my parents apartment. So now even we use the door in the "door yard" to come and go. It is new and no where near as grand as the front. 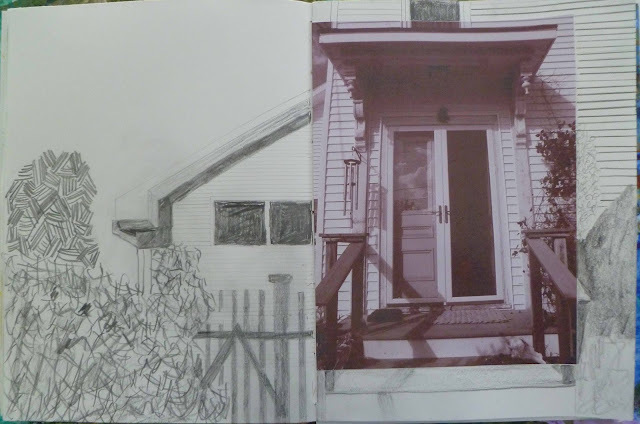 I have taken a picture of the front entrance and then expanded the image with sketch. Fun, Beth! Hope you are finally feeling well. We switched to front door main entrance years ago and I luv it. Back door is now blocked up and I don't have to worry about people falling down basement stairs. Make your house work for you is my motto!!! I appreciate very much what you do now, I think this is something different but interesting for you. I actually love sketching and painting but it doesn't always end up on the blog. This is such a great perspective.